The dunes at Erg Chebbi, near Merzouga. A sight worthy of Lawrence of Arabia, which was actually filmed nearby. 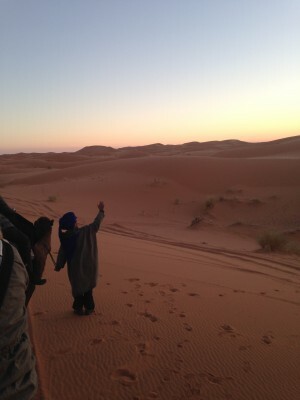 I’m not sure when or why I decided to visit Morocco this holiday season, but I’d like to think it had to do with my experience working on Salomé. The cast was truly international, and meeting and working alongside artists from Syria (Ramzi Choukair and Lubana Al Quntar), Morocco (Ismael Kanater), or Israel (Yuval Boim and Shahar Isaac) made me realize that these places aren’t just abstractions. They’re filled with people, living their lives. What I didn’t expect, though perhaps it was unavoidable, was to find so many echoes of Shakespeare. It wasn’t until I got back to Washington and started working on Othello this week that I realized I had been walking in that world the entire time. In some cases, the linkages are obscure, but in others, they are profound. 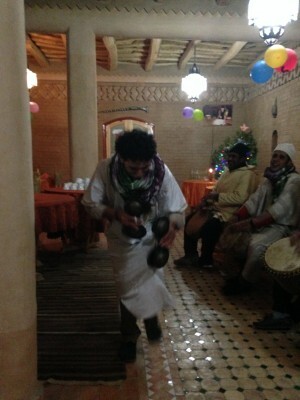 An impromptu Berber concert at an inn in Rissani, deep in the gorges, complete with hypnotic drum circle, castanets, and enthusiastic amateur dancing. 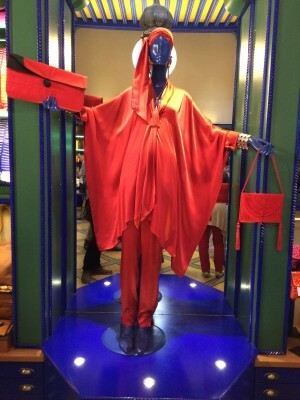 Berber chic at Yves Saint-Laurent’s “Love Boutique” in Marrakech. Saint-Laurent, born in nearby Oran, made his home in Marrakech late in life, and his well-preserved, art deco “Jardin Majorelle” also houses a Berber museum. Perhaps because of the word’s racist connotations, nobody I met in Morocco would ever dream of identifying themselves as a “Moor,” but I was surprised to see many proudly claim their Berber heritage. Much of the country outside the famous cities (Casablanca, Fez, Marrakech, Tangier) is comprised of mountains and deserts, and people are still in touch with the millennia-old nomadic ways of life of the native Berbers, or Amazigh (“The Free People”). Berber designs appear on rugs and in chic Marrakech boutiques, and the Berber language is increasingly being taught alongside Arabic in schools. Though Shakespeare never explicitly identifies Othello’s religion, the unspoken elephant in the play is Islam. With every Shakespearean mention in the play of “turning Turk” or running off with an “errant barbarian,” one can sense the prejudicial fears of the “uncivilized” Islamic-Other lurking in the dark unconscious of the times. 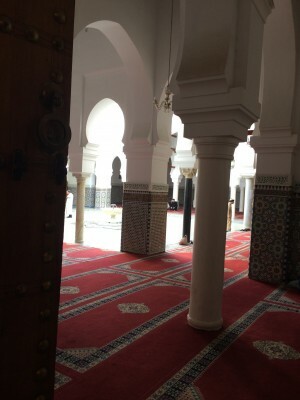 Inside a madrasa in Fez. When you visit Morocco, the influence of Islam on the culture of everyday life is everywhere, impossible to ignore. 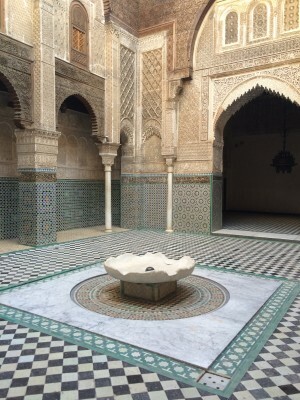 You can hear it in the calls to prayer that erupt from amplified loudspeakers five times a day, and you can see it in the artistic traditions, all of which are strictly nonrepresentational, tending toward calligraphy and tilework. It was a shock to see paintings with faces for sale when we got to the souks of Marrakech at the end of the trip. I was able to visit a former theological school, or madrasa, in Fez (all of the mosques still in operation are closed to non-Muslims). The intricately carved tiles, or zellij, and the fountain for ritual ablutions are both in keeping with Islamic tradition. 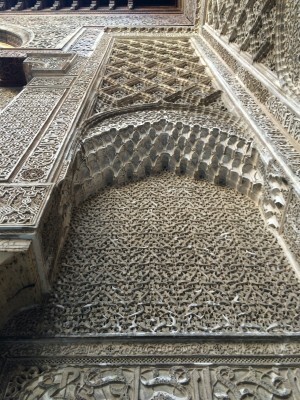 Yes, that is all writing, in Arabic, intricately carved on every inch of a massive wall. 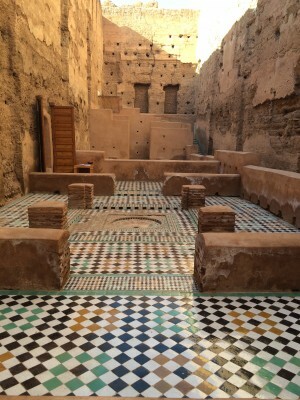 The theatrical effect of experiencing Moroccan architecture is hard to describe: featureless, windowless walls on the outside open onto ornate courtyards, which in turn open to the sky. I have to admit I wasn’t prepared for the astonishing beauty of places like this, a repository of thousands of years of diligent human craftsmanship; it was humbling to sense a culture of untold complexity lying far beyond my own limited, Western, secular comprehension. 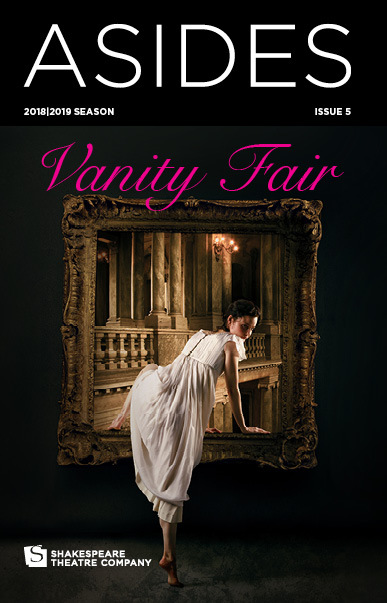 In his genius, Shakespeare builds this into the play: the Othello of the second half of the play, when the action moves to Cyprus, is different from the man who charmed Desdemona with romantic tales of far-off places. We only get a few cryptic details of his past life in North Africa and Arabia, and we can’t be sure if Othello is lying or telling the truth about slaying a Turk in Aleppo or an Egyptian prophetesses placing curses upon their weaved handiwork. Shakespeare and the character keep the truth almost entirely concealed, leaving just a few cracks open. Though it’s not a direct source for the play’s plot, most scholars agree that Shakespeare drew from Leo Africanus’s Description of Africa, which was translated in 1600, particularly for Othello’s description of his travels in act one, scene three. Africanus was born in Islamic Spain with a Muslim name, al-Hasan ibn Muhammad, before being captured and taken to Rome while on a diplomatic mission to Constantinople. In many ways, his biography, dotted by travels to Rhodes, Egypt, and Mauritania, all locations mentioned in the play, reads like a version of Othello’s. 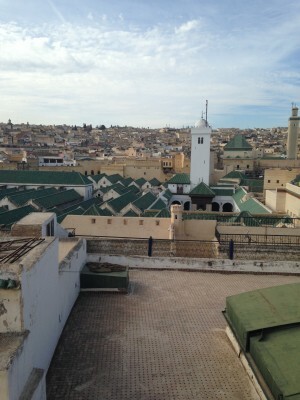 A glimpse of the University of al-Qarawiyyin in Fez. Because of the closely intertwined buildings in Moroccan cities, it is impossible to get a sense of the size of the building unless viewed from the nearby rooftops. The green roofs of the University of al-Qarawiyyin viewed from a neighboring rooftop. I had no idea when I took these pictures that Africanus had been educated right here, in Fez, at the University of al-Qarawiyyin. 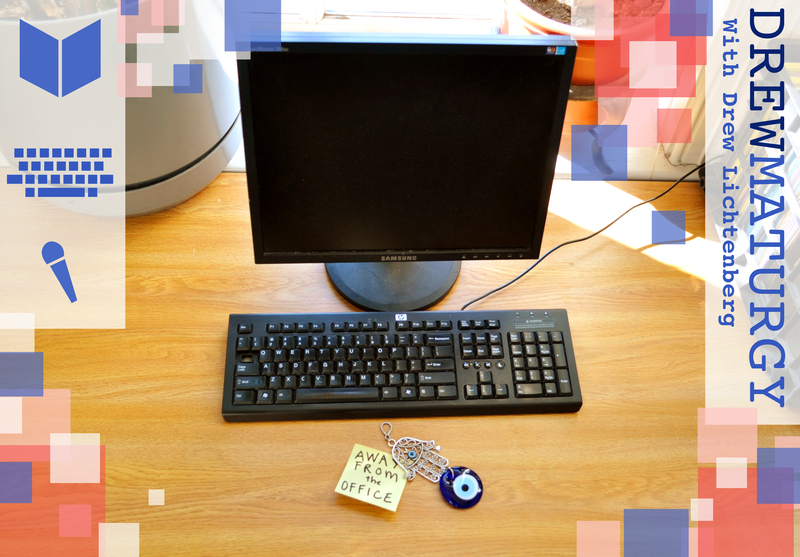 Founded in 859 as a mosque, it’s one of the oldest continually operating universities in the world. “Most honest people they are…very proud and high-minded…and they are so credulous, they will believe matters impossible which are told them. No nation in the world is so subject unto jealousy, for they will rather lose their lives than put up any disgrace in the behalf of their women.” (Description of Africa). El Badi Palace in Marrakech, the home of Moulay Ahmad al-Mansur. In Asides, I write about another Moroccan who overlapped strangely with the world of Othello: Abd el-Ouahed ben Messaoud, a diplomat from Moulay (King) Ahmed al-Mansur, who visited Elizabeth’s court for six months in the fall of 1600. During precisely this span of time, Shakespeare’s troupe, the Lord Chamberlain’s Men, performed at court. Did Shakespeare meet this Moor of England? We’ll never know. el-Ouahed’s diplomatic mission apparently was to convince Elizabeth to embark on a joint invasion of Spain. She had defeated the Spanish Armada in 1588, and the rulers of Morocco had lost Spain in 1492, during the Reconquista. Alas, Elizabeth and Al-Mansur would both be dead in a matter of months, and the likelihood of a military partnership between the two was likely slim-to-none. It is fascinating, however, to think of how different history might be today if Europe had formed a fruitful partnership with the Islamic world. Instead, we have Othello, which tragically commemorates a very different kind of story.